WHAT – Echoes, the annual cultural festival of IIM Kozhikode in association with filmmaker Shekhar Kapur has launched a short film making competition titled “I Love Paani”. The event has been conceptualized and will be judged by the filmmaker himself. CONTEST – This is an online event. Teams of 3 or less will have to create a one minute video on the creative brief given below and then either mail the video or its dropbox link to culcom@iimk.ac.in before 23.59.59 PM, 24th December, 2013. Shekhar Kapur will be judging the entries and will decide on the winners for the event. And how do you imagine a world which is fast running out of water. Can you put that in a film no longer than one minute? You could shoot and edit it in any way you like. You could shoot it on your smart phone if you like. This is about your imagination, not your resources. It does not have to be about a large scale event, a drop is as vast as an ocean. It does not have to be the future. There is enough evidence of massive shortages right now. It can be as observational as you want it to be. Or it can be as dramatic as you want it to be. But even if you say very little, others have to see your point, your story. Of water. – This event is open to all. – A team can have a maximum of 3 members. – One person cannot be part of more than one team. – The video length is 1 minute. Not more, not less! – This slide must be included at the end of the movie. – There is no bar on the language used in the movie. However, Hindi/English subtitles should be used in case of languages other than these two. – Entries (video files or dropbox link) should be mailed before the final deadline of 23.59.59 PM, 24th December, 2013 to culcom@iimk.ac.in. Winners also get a chance to meet Shekhar Kapur in person. 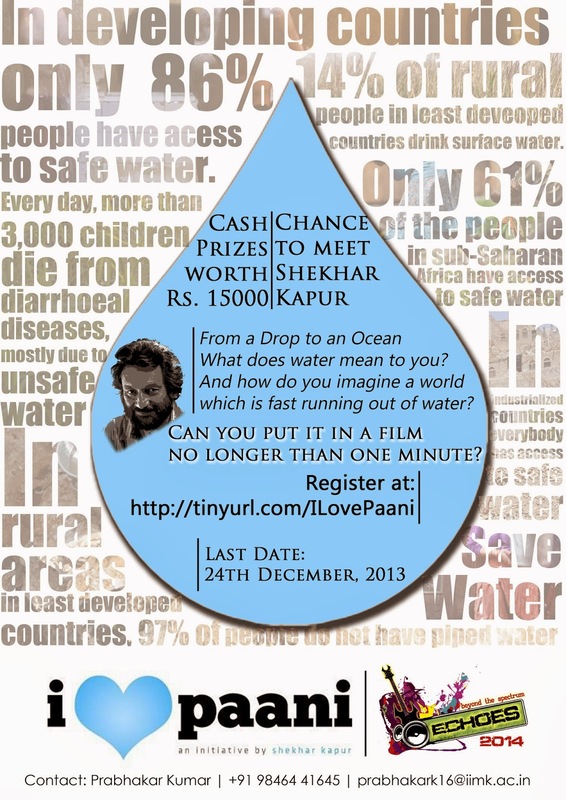 – Shekhar Kapur, “I Love Paani” and/or their associates, reserve the right to use and upload all the short film/s in a manner they deem fit on their own or their affiliates websites/platforms for various purposes and the contestants shall not have any claim or objection whatsoever regarding the same. – Shekhar Kapur will be meeting the winners in Mumbai on a date and time convenient to him. All costs (Travel & Lodging) has to be borne by the winners. Reimbursements from our side will be restricted to INR 2500 only. mFC Editorial – If you want to get into filmmaking and wondering where to start, here’s a great opportunity. None other than Shekhar Kapur will see your work, and am sure if you can impress him, few more things can come out of it. Generally that’s how it works. So do give it a shot. All the best. Though we would also like to point out the weird clause put up by the organisers in their “Terms and Condition” section. It’s fine to upload it on various platforms but it’s unfair to use it for commercial purpose without the filmmaker gaining anything out of it. Hope they change it. prize money could be increased.